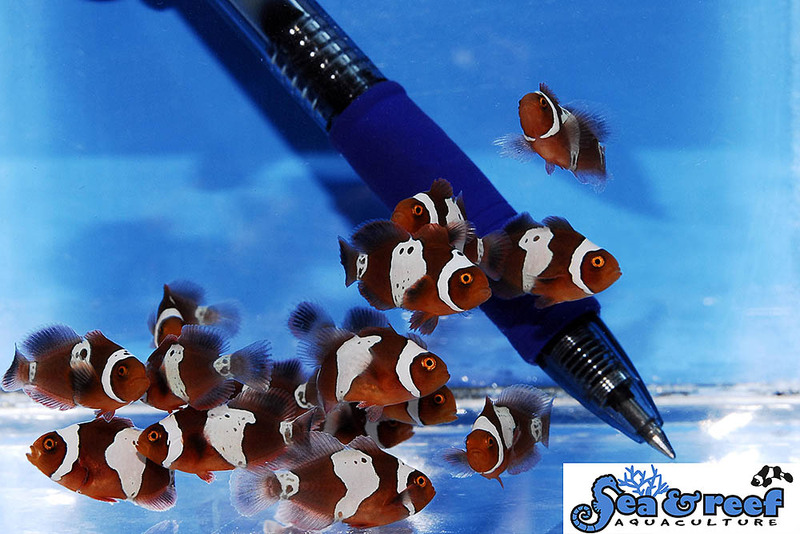 Online retail saltwater and freshwater aquarium fish direct from Matt Pedersen via MiniWaters.FISH – shop online now! 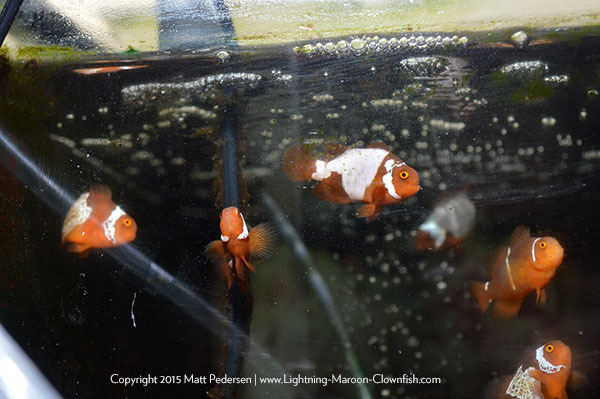 Since the Lightning Project started, and particularly once progeny first became available, I’ve had countless inquiries about purchasing Lightning Maroon Clownfish direct from me. 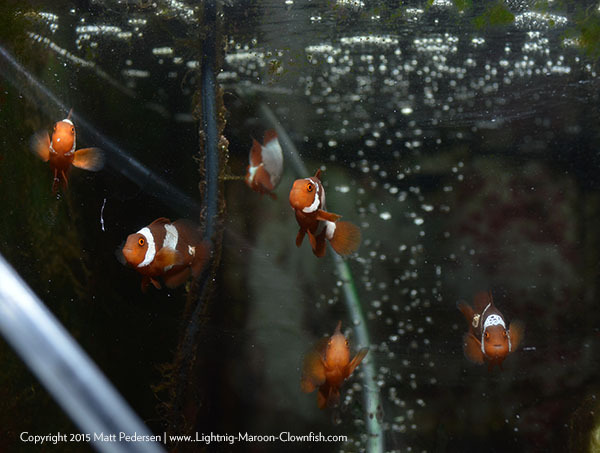 In 2013 and 2014, all the offspring I had to offer were sold exclusively through Blue Zoo Aquatics and the team there. 2015 saw a dramatic uptick in production and availability from Sea & Reef Aquaculture; meanwhile for multiple reasons I don’t think I reared a single fish in 2015. However, the holdback pair, MD1 and MD2, started spawning for my good friend Mike Doty, and thus, we’ve had F2 fish available as I announced late last year. 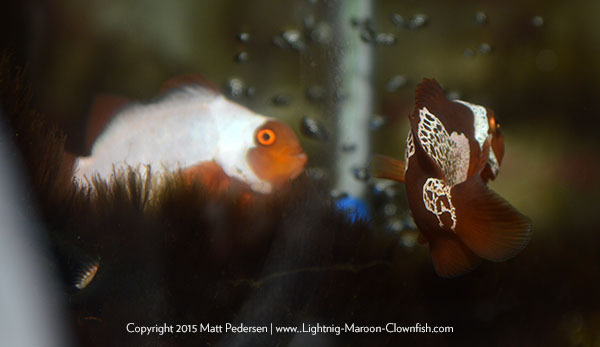 There are also very limited F1 Lighting Maroon offspring straight from the wild pair that I will make available. To be frank, we’ve been offering these fish at wholesale to stores, but have had very limited interest, which is surprising since so many of the shops had been asking for them for so many years. 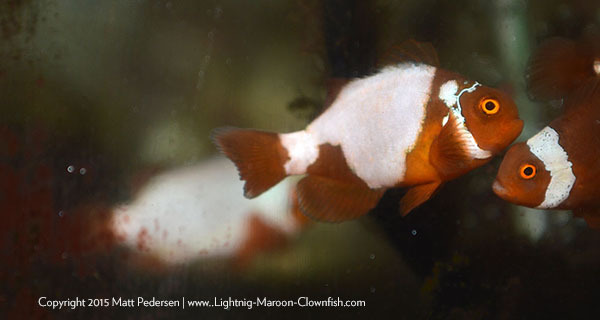 Furthermore, our breeding here in Duluth, MN, is currently the only production of high-coverage to all-white Lightning Maroon Offspring that I’m aware of, which means the shops and retailers that have wholesale accounts with us have access to very exclusive premium quality Lightning Maroons to ultra quality Lightning Maroon Clownfish that no one else can get! 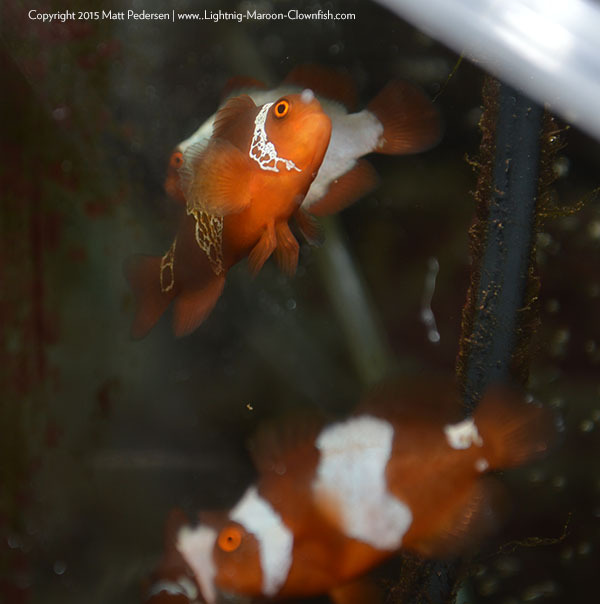 These are the fish like the pair I held back; the entire bodies of these fish are expected to break up over time into the lace-like network of red spots. 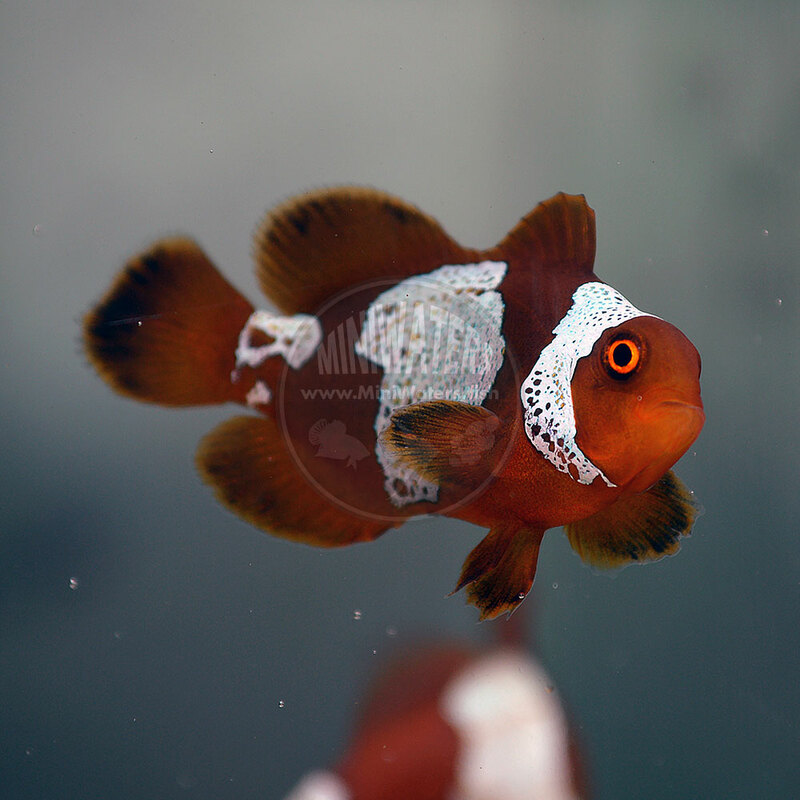 And of course, we have plenty of more traditional type standard grade Lightning Maroon Clown offspring as well, and they’re not 100% related to the Sea & Reef bloodlines either. When it comes right down to it, as breeders, we need to sell fish. And as much as I run and offered wholesale exclusively for the past few years to “support the LFS”, if the stores aren’t buying what we’re producing, yet we know you guys WANT them, we had to find another way. So as of January 1st, 2016, I personally launched MiniWaters.FISH. 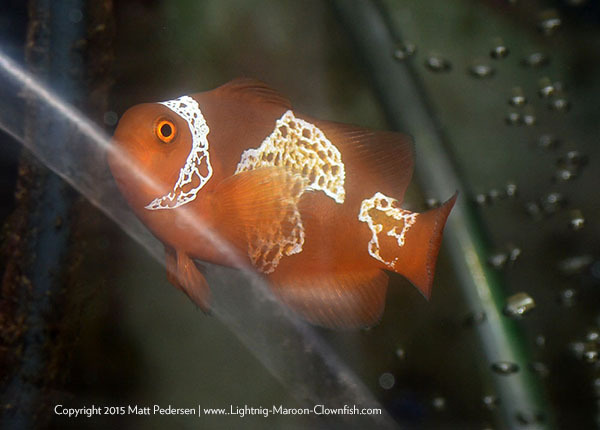 This is exclusive, direct from Matt Pedersen offerings of mostly captive-bred marine / saltwater fish (with the occasional freshwater offerings just to mix things up). Some fish are produced here, some produced by other breeders, and all carefully chosen to suit my own tastes first. In short, I’m only going to intentionally stock fish that IF they never sell, I’ll be happy to call them pets for their rest of their lives! If you like my tastes, then you’ll like what I’m offering. 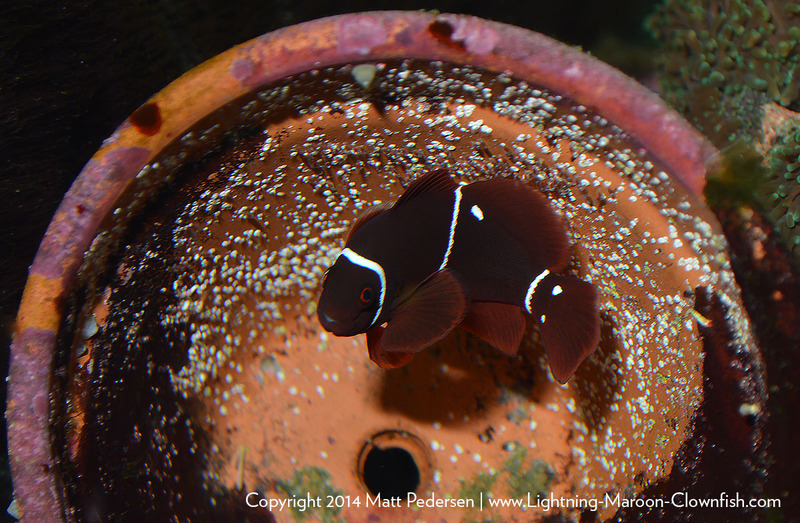 If you want to buy Lightning Maroon Clownfish, well, for obvious reasons, this is the first place I’d suggest you look! And I’m still offering wholesale to local shops; my retail pricing is such that any shop should be able to purchase from my wholesale list and, if they desire, undercut my online pricing while still making an industry-standard basic retail markup on livestock. 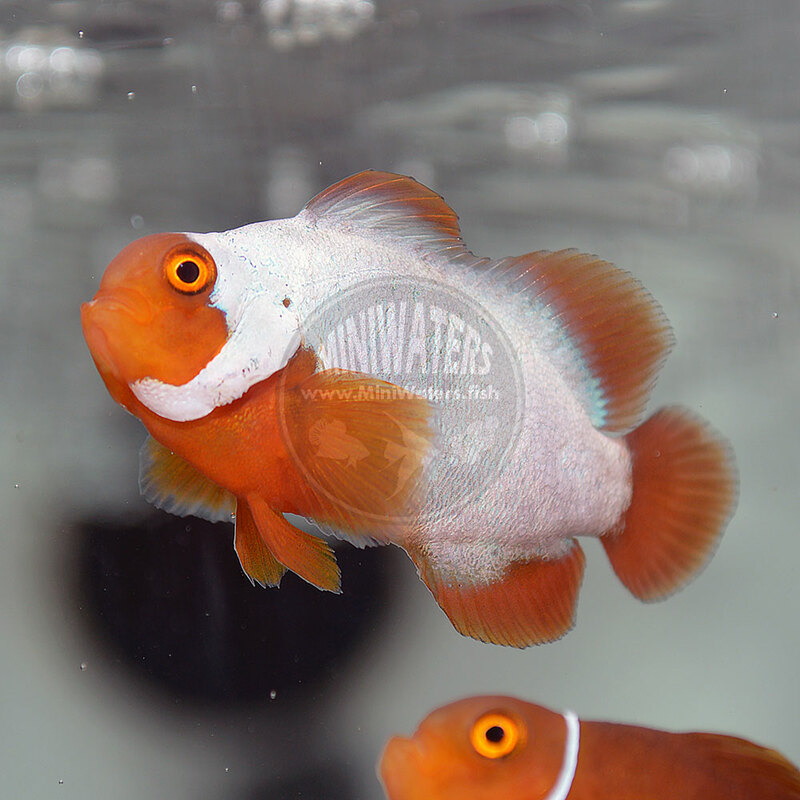 See the MiniWaters.FISH wholesale page for more information – I’m STILL trying to “support the LFS”! Customers in the upper midwest have an added bonus; residents of MN, WI, Northern IL and Northern IA can get overnight shipping for as little as $10! Yes, MN retail customers, you get stuck with full Duluth city-rate sales tax..it is what it is…but shipping in the upper midwest is a screamin’ deal! So please be sure to check out MiniWaters.FISH. 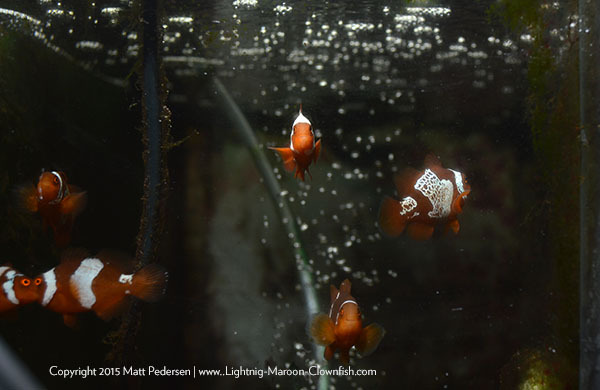 Please “like” the MiniWaters.FISH Facebook page too so you get updates. I won’t be posting much in the way of “promoting sales” here on The Lightning Project per-say, as that’s not really the point of this website. 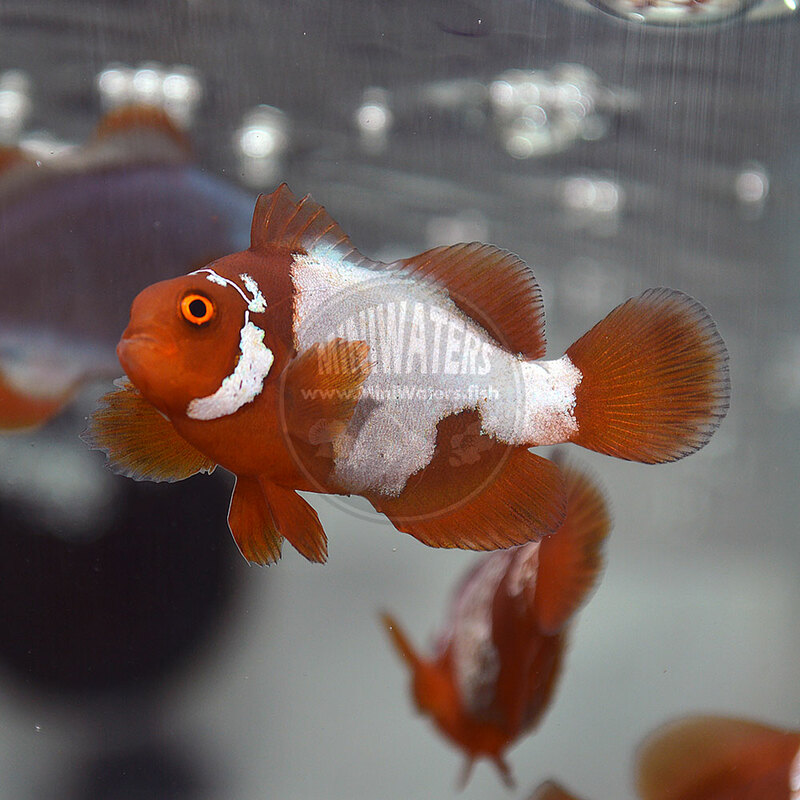 But, breeders need to sell their fish and aquarists need to buy them, so…wholesale or retail, drop me a line at MiniWaters.FISH and maybe I can send something your way! There are pretty crappy images, but they are the offspring of the MD1 X MD2 Lightning X White Stripe pair. Wholesale customers have access to these fish at this time. 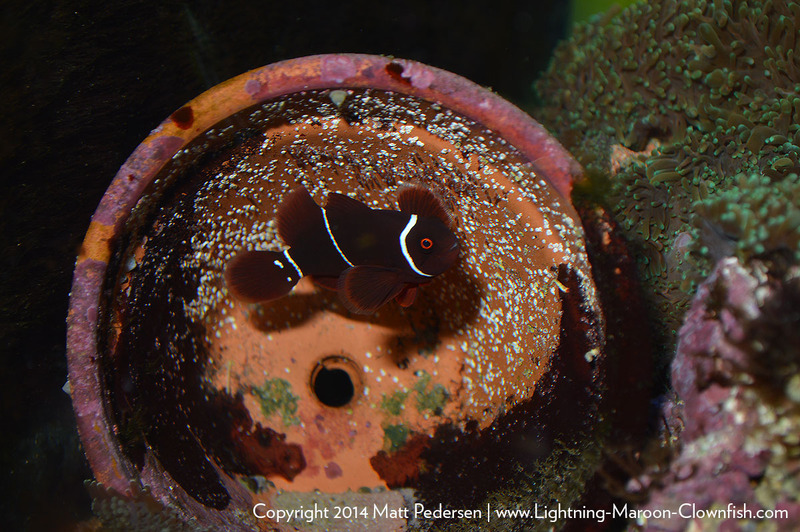 Surprised to hear that tonight, Mike Doty’s pair of Lightning Maroon Clownfish had thrown down eggs. This is one of the freely distributed “genetic repository” pairs I placed locally, just in case anything ever happened here at home. 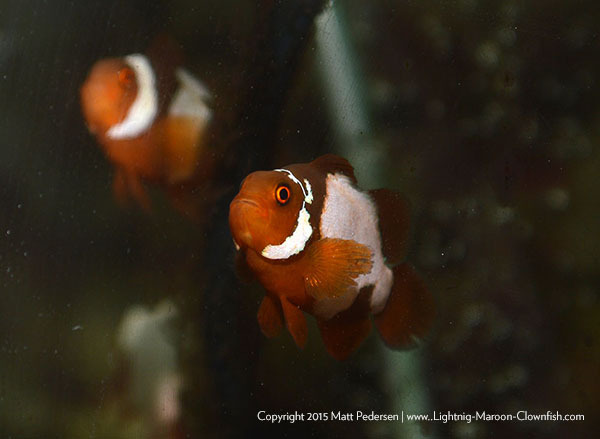 The female Lightning Maroon, MD1, and male Morse Code Maroon, MD2, represent the first F1 sibling pair that I am aware of which should replicate the pairing of their parents. 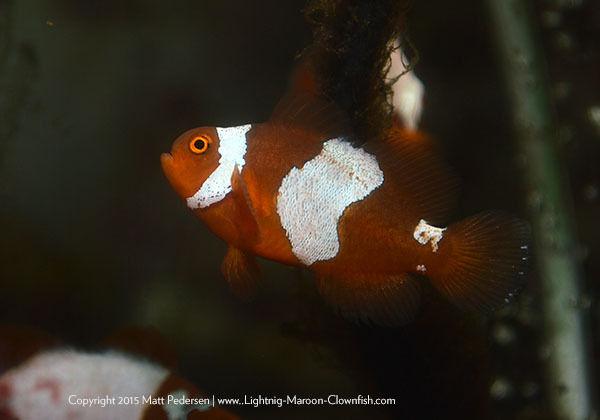 We already know of the results Soren Hansen had when pairing an F1 Lightning Maroon Clownfish with a wild White Stripe Maroon; I expect that Mike will see a 50/50 White Stripe/Lightning spread in the F2 generation from Mike’s parents. 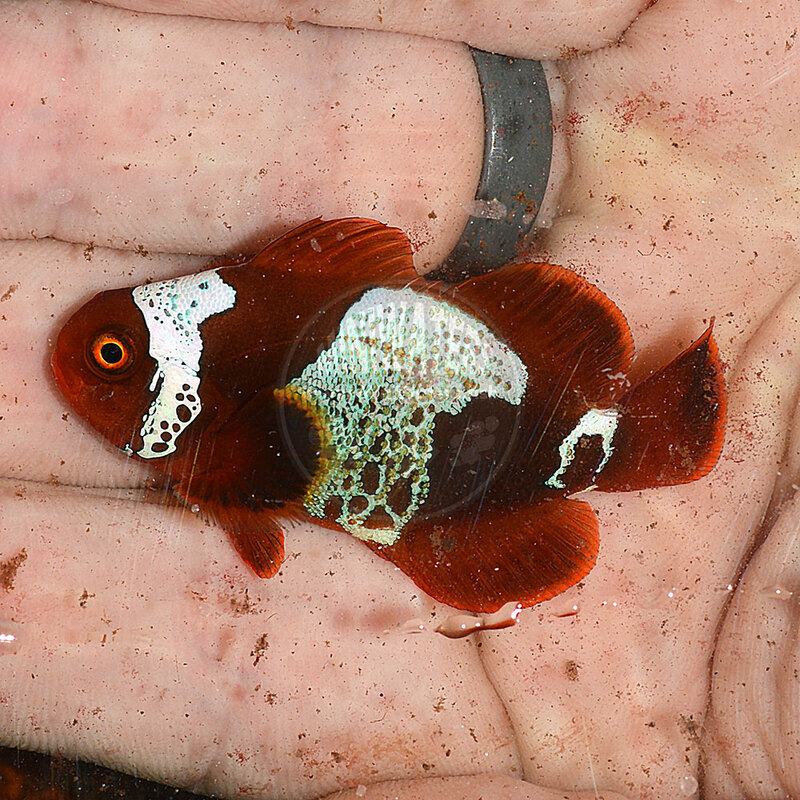 The first second-generation Lightning Maroon Clownfish, progeny of a F1 Lightning Maroon mated to an unrelated, Wild (F0) PNG White Stripe, produced by Sea & Reef Aquaculture. 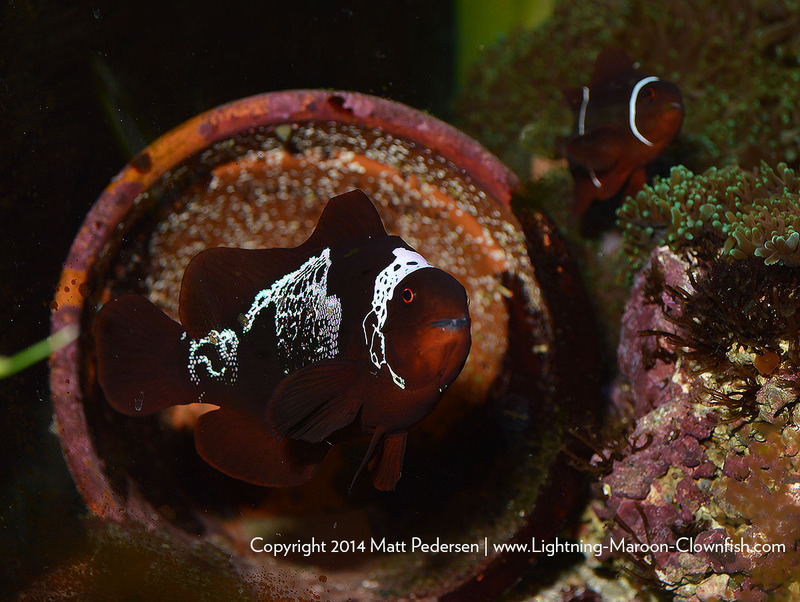 I had to sit on this news since last month as this was an exclusive for CORAL Magazine; now that the magazine is out I can shout it out – Sea & Reef Aquaculture has succeeded in producing a second generation of Lightning Maroon Clownfish by using LM12 (an F1 from my pair here) with an unrelated wild (FO) PNG White Stripe Maroon. Highlights include the same 50/50 offspring split, as well as the interesting fact that Sea & Reef used the Lightning as a male vs. female. 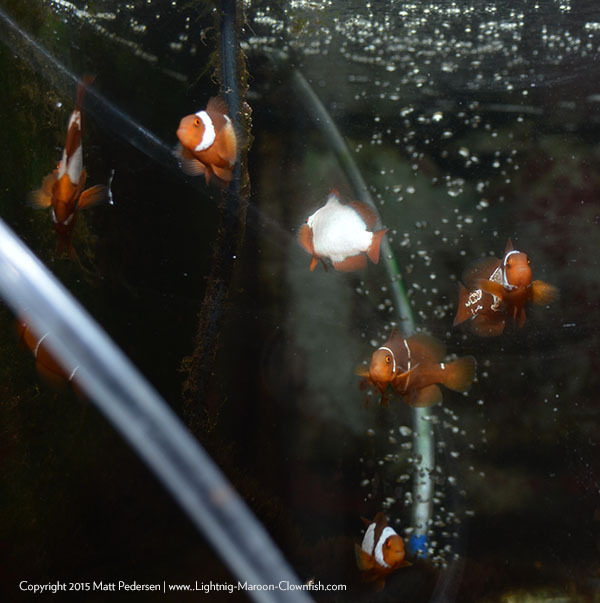 As it’s a CORAL Magazine exclusive, I invite all Lightning Maroon Clownfish fans to head over to Reef2Rainforest.com and read the EXPANDED online version there. I should note, I actually didn’t want to write the story (I prefer to have people tell their own stories) but in the end, the job fell to me. I hope you enjoy!